In Spirit of the Smokies, I once again take time to explore America’s Wildlands and pay homage this nation’s majestic parks. It is my second effort in this series. Situated along the border of Tennessee and North Carolina, the Appalachian and Blue Ridge Mountains serve as backdrop to my selected mountain scene. 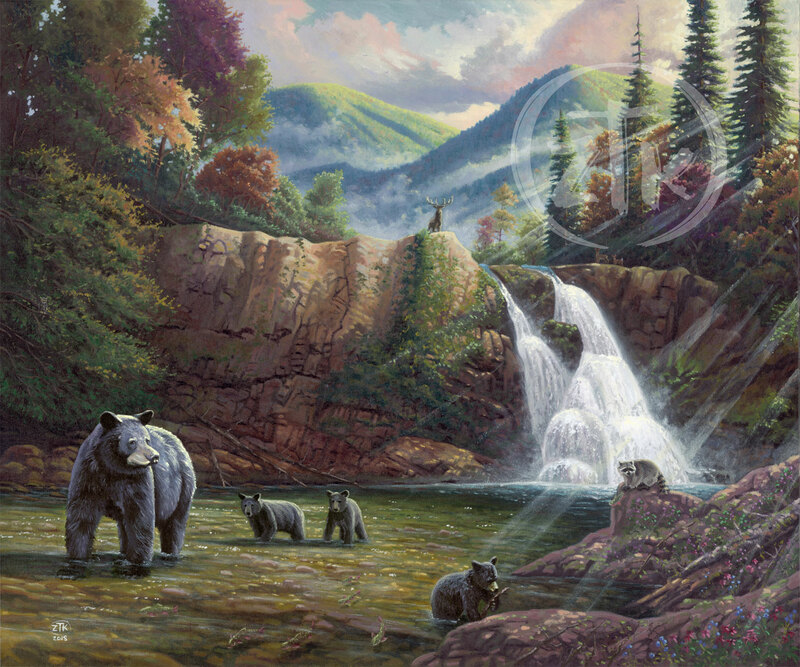 As Abrams Falls splashes behind, a mother black bear and her three cubs forage the flowing stream for food and fun. A mountain raccoon takes a moment to watch the furry family while it holds on to its dinner in the form of a brook trout. Standing above it all, a North American elk looks down on its fellow woodland denizens as it is silhouetted against the shifting mists and striking foliage of this ancient forest habitat. I have visited the Smoky Mountains on many occasions and I am always struck in wonder at the beauty of the area. As you hike these hills, you will see subtleties of light and color that can truly inspire artistic vision. It is also a place rich in a unique culture and an unabashed appreciation of the simple life so far removed from the chaos of the city. I hope you all can find some time to join me as I take my own moment to reflect and re-center myself in the Smokies and this sun-drenched hallow. And, as always, I want to thank you all for sharing my adventure in art. Situated along the border of Tennessee and North Carolina, the Appalachian and Blue Ridge Mountains serve as a backdrop to my selected mountain scene. As Abrams Falls splashes behind, a mother black bear and her three cubs forage the flowing stream for food and fun. A mountain raccoon takes a moment to watch the furry family while it holds on to its dinner in the form of a brook trout. Standing above it all, a North American elk looks down on its fellow woodland denizens as it is silhouetted against the shifting mists and striking foliage of this ancient forest habitat. As you hike these hills, you will see subtitles of light and color that can truly inspired artistic vision.